Interesting fact: Buffy the Vampire Slayer Season 2 Episode 19 was delayed more than two months when it originally aired. The serious subject of the plot's topic (a shooting in school) might have been one of the reasons why the series had a big gap in between episodes. I'm indifferent when it comes to "I Only Have Eyes for You." It was a fun hour that explored poltergeists and love, but it didn't feel essential to the plot. Regardless of the rewatch possibilities, there isn't a strong pull to it. Are you a fan? Let's chat it out by rewatching "I Only Have Eyes for You." Buffy made a lot of bad decisions when it came to dating. Her turning down Ben was one of them. By this point in Buffy the Vampire Slayer Season 2 Episode 19, she should've been ready to move on and date other people. Angelus had already killed a good number of people in Sunnydale, including Jenny Calendar, and he made it known that he wanted her dead. Previous love or not, she said that she was over him, but she never followed through on her beliefs. Ben had a lot of guts to ask her out. We'll add him to the list of missed opportunities she could've taken. Here's the thing about Buffy stopping the boy from killing his girlfriend: How did Buffy get to Sunnydale High coincidentally in time? Was it an editing goof? She left the group at The Bronze to see Giles and she stumbled across this boy nearly shooting his girlfriend. However, the time it would take (on foot) for her to get from The Bronze to the school would've taken a lot of time. Did the couple stay late at the school? Did Buffy get a ride? Something doesn't feel right for this plot convenience. However, if this tidbit meant that we got the scene of Buffy being accused of making it up by Principal Snyder, we can all agree it's a fair trade. He's still a horrible character, but this was one of his better evil moments. Any normal, and sane, person would heed Buffy's warning. 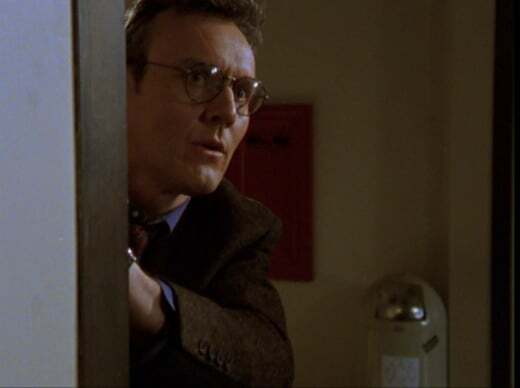 Did anyone else find Giles frustrating in Buffy the Vampire Slayer Season 2 Episode 19? Sure, he was heartbroken over Jenny's death, but he clouded his judgment too much over the possibility of Jenny being the poltergeist. And, for a man in love, he didn't know Jenny's character at all. Even if she had the chance to be a ghost, she never would've became a poltergeist. Jenny was smart, determined and loved the Scoobies. She would've given warnings over an impending evil than to actually cause harm to another individual. This Monster of the Week development didn't match her character's personality, so it was obvious to the casual observer that Jenny wasn't the ghost. It's great that Giles got a piece of Jenny as a result of Willow's classroom role (the rose quartz). He did need the protection and peace of mind. Another one of Buffy's Slayer dreams returned and it solved a lot of questions. This one may be one of the more vivid dreams she's had in a while. The last one in Buffy the Vampire Slayer Season 2 Episode 18 had to be more of a fever premonition than anything else. Two premonitions were included in one dream sequence. In this case, the inclusion of the scene between the teacher and student from 1955 made it known they were the ghosts. All of the answers were right there. And, if you add in the falling yearbook and the current teacher writing the same dialogue on the chalkboard, this mystery basically solved itself. So, as I mentioned above, Giles thinking that Jenny was the poltergeist made no sense. How many times do you think this possession happened before? 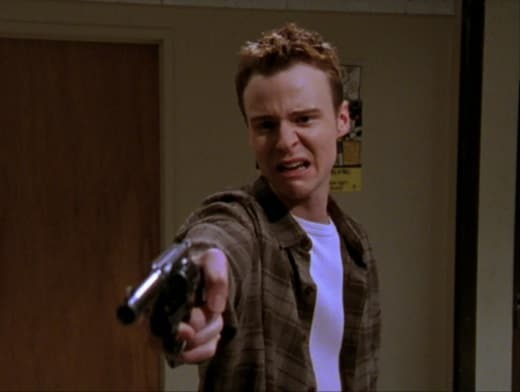 By the end of Buffy the Vampire Slayer Season 2 Episode 19, the shooting happened three times, with at least two of them resulting in someone being shot. In most cases of the Monster of the Week, the events are tied to a demon arriving to town or something ongoing started by humans. These two ghosts died in 1955, so there was nearly 45 years between their deaths to this haunting. Did other people die because of this? Was this the first time it happened? Since nothing was explained, we'll just go with it. However, it's a shame that the teacher killed by the janitor wasn't able to be saved as well. She's the only real casualty. Giles needed to step in sooner to stop it. Angelus's new home was a positive shift for Buffy the Vampire Slayer. We saw a lot of warehouses and dark sewers before this, so for the main Big Bads to have a grand home now, it was a nicer touch. We only get this set between now and Buffy the Vampire Slayer Season 3. Enjoy it while you can! Though, it did add another question about Sunnydale's town layout. How many big manors like this are in this town?! The surprise additions never end. Spike: Well, our old place was just fine till you went and had it burned down. Angelus: Things change, Spikey. You gotta roll with the punches. Well, actually, you pretty much got that part down, haven't you? Angelus: What can I say? I just love to see you smile, buddy. Permalink: What can I say? I just love to see you smile, buddy. The supernatural manifestations from the haunting were some of the best moments of "I Only Have Eyes for You." We were treated to both few fun visual scenes and answers regarding the town. Sure, a lot of weird things happen at Sunnydale High, but these were all such sudden moments that people couldn't simply ignore them. Xander being grabbed by the locker monster didn't have a big surprise; the hand looked more like a costume prop than anything. However, the spaghetti turning into snakes was a huge reaction. The ensuing chaos brought on a lot of panic from the Sunnydale High students. From the way they were falling over each other to get out, we witnessed a disaster movie in the making. There was a subtle nod to the upcoming evil in Buffy the Vampire Slayer Season 3 that you may have missed. Principal Snyder talked with one of the police officers about the strange supernatural events and the hellmouth being under the school. This dialogue answered a lot of questions. Firstly, we now know that Snyder knows about the evil under the school and that Buffy wasn't lying. Second, the town is aware of the evil and thirdly, so does the mayor. The mayor is ultimately the Big Bad of Buffy the Vampire Season 3, so it's great to see his character being mentioned in already. Willow: Xander, what happened? Did Cordelia win another round in the broom closer? Xander: You’re just a big bucket of fun, Will. I'll have you know I was just accosted by some kind of, um, locker monster. Rupert Giles: Loch Ness Monster? Buffy: “Locker” monster is what he said. Permalink: “Locker” monster is what he said. Things only escalated once the Scoobies decided they were going to exorcise the spirit. James (the teen ghost) fought back hard to keep the group from completing their goal. He really didn't want them to cleanse the school and stop him from doing another round of torment. Out of the Scoobies, Cordelia and Willow received the harshest torment by James. Cordelia's vanity is her Achilles' heel and seeing her face mutate was the easiest way to hurt her. The snake bite from earlier provided a great opportunity to play into the torment. Though, Willow nearly being sucked into the ground trumps everything. She nearly died and became part of the school! These were great special effects by the team, especially after seeing the cheesy monster arm from before. Buffy the Vampire Slayer Season 2 Episode 19 needed these elements to make up for that move. James's motivation against the Scoobies made no sense in the grand scheme. Don't me wrong, I understood the curse of having to relive shooting Ms. Newman over and over again. He loved her, made a terrible decision and had to relive his pain for eternity. The confusion stems from why he stops the Scoobies from exorcising him. Being freed from his torment should sound like paradise, especially since he was in pain. The Scoobies were giving him a way out, but he stopped them with the bugs. Part of it had to be a self-imposed prison that he forced himself into. The guilt he felt manifested itself into a purgatory that lashed out. Though, lashing out nearly 45 years later was still questionable, but that's a separate point already discussed above. Xander: He killed a person and killed himself. Those are pretty much two of the dumbest things you could do. Willow: I know, but...well, don't you feel kind of bad for them? Buffy: Sure I feel lousy. For her. He's a murderer and he should pay for it. Buffy: No, he should be doing sixty years in a prison, breaking rocks and making special friends with Roscoe the weightlifter. Xander: Yikes. The quality of mercy is not Buffy. Permalink: He's a murderer and he should pay for it. James possessing Buffy and seeing a connection in her was the perfect revelation. Buffy had been carrying so much guilt since sleeping with Angel and turning him into Angelus. Her action, which wasn't bad, unfortunately caused the death of countless people. She's had to live with the weight of that guilt all this time. It's no wonder she was snapping at people and closing herself off. When you pair the dialogue of James and Ms. Newman together, it strangely had a lot of similarities to the turmoil that Buffy and Angelus were currently going through. Buffy didn't want to give up Angelus and the pain was too much. It's almost poetic in a way. But, it's also a brilliant plot device that changes what you'd come to expect from the plot. Angelus: Fun fact about wasps. They have no taste for the undead. Not that a sting would do me any damage, it's just...tonight's special. I wanted to look my best for you. Buffy: [Possessed] You're the only one. The only person I can talk to. Angelus: Gosh, Buff. That's really pathetic. Buffy: You can't make me disappear just because you say it's over. Angelus: I just want you to be able to have some kind of normal life. We can never have that, don't you see? Buffy: I don't give a damn about a normal life! I'm going crazy not seeing you. I think about you every minute. Permalink: You can't make me disappear just because you say it's over. On the other hand, the Scoobies also didn't solve the case either. They were essentially pointless to the progression of winning the plot. Think about it: No one actually stopped James or solved the case. It happened naturally on its own. James possessed Buffy because he connected with her...and her closest companion in the area at the time was Angelus. If it had been anyone else, that human person would've died. The cycle would've continued and Sunnydale High would've stayed haunted. Being a vampire coincidentally saved the day. Though, if we want to get technical here, Drusilla sent Angelus to find Buffy. Drusilla can add this win for the good guys. Let's give a round of applause for Spike. He caused the biggest cliffhanger by simply standing up from his wheelchair. By Buffy the Vampire Slayer Season 2 Episode 19, his scars were already healing fast, so it was only a matter of time before he would be fully recuperated. When he got up from his chair, the intense music and the camera angle made it known that we needed to take notice. Spike wasn't going to take Angelus's torment sitting down anymore. His standing up shocked me when I was eight years old. Now all these years later, it still has a good affect on me. Willow: You’re thinking too much. Maybe you need to be impulsive? Buffy: Impulsive? Do you remember my ex-boyfriend, the vampire? I slept with him, he lost his soul, now my boyfriend's gone forever and the demon that wears his face is killing my friends. The next impulsive decision I make will involve my choice of dentures. Willow: Okay, the Angel thing went badly. I'm on board with that, but that's not your fault. And anyways, love isn't always like that. Love can be...nice. What did you think of "I Only Have Eyes for You"? Was this the perfect tease for Buffy the Vampire Slayer Season 3? How many people do you think died from this curse? Did you love the Spike twist? Want to join us in rewatching Buffy the Vampire Slayer? We'll be posting new rewatch posts every Tuesday and Thursday. Come back here and let us know what you think of the episode. Giles: To forgive is an act of compassion, Buffy. It's-it's...it's not done because people deserve it. It's done because they need it. Buffy: No. James destroyed the one person he loved the most in a moment of blind passion. And that's not something you forgive. No matter why he did what he did. And no matter if he knows now that it was wrong and selfish and stupid, it is just something he's gonna have to live with. Xander: He can't live with it, Buff. He's dead. Cordelia: Okay. Over identify much? Permalink: To forgive is an act of compassion, Buffy.